Wattpad. The space of stories. Social storytelling has become a platform, and this story platform, Wattpad, consists of more than 70 million readers and writers with the power of stories. Install this application if you intend to read and write original stories and then see what other writers and readers share. Avoid writing copy content to write original books. However, this platform can be useful for looking at examples and inspiration. Now, if you intend to write a book, start writing immediately. A writer cannot reach anywhere by following the status of other authors in social networks. There will be place copying. Use this platform a little to avoid being a good copycat. Because ultimately Wattpad is a social media. And social media accounts are there to steal your time. Stay alone with your work. 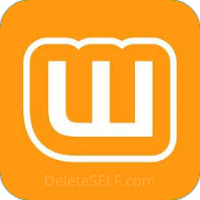 Follow the link and instructions below to delete your account without spending a lot of time with Wattpad. Type in https://www.wattpad.com/user/yourusername replacing 'yourusername' with the username of the account that you just closed. then you should get a 'User not found' page. Do not sign into your account again, this will reopen your account through self-restoration.